Lou and Susan having words about Izzy. 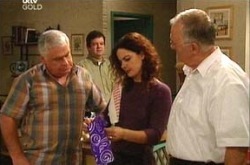 Susan tells Harold about the argument she and Lou just had about Izzy, but instead of sympathy she gets Harold telling her that she's been a little over the top. Susan gets annoyed when Harold suggest she feels "undervalued" because she's an older woman than Izzy. She leaves, and Sky (who's heard all of this) can't believe her ears. Stu's singing off-key, fixing a car when Johnathon drives up. Johnathon's bearings aren't working and need fixing. He wants to hang around while Stu checks out the car. Sky and Harold are cleaning and talking about Susan and Izzy. Sky wonders if Susan can see something in Izzy that other people can't, but Harold's not so sure. Lou comes in and tells Harold that David's BMW has a hairline scratch on the side of it (Harold's been taking it out for a drive on the sly). They race out to check it. 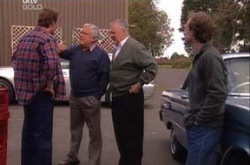 Lou and Harold drive up and tell Stu the car needs fixing. Stu tries to tell them that he's got too many jobs in front of him to make it a priority, but Lou won't listen to him and Stu gives in. Johnathon notices Stu's not happy about the situation. David, Liljana and Serena Bishop arrive earlier than expected. David and Harold are civil but awkward around each other, (and Liljana calls Harold, 'Tata'). 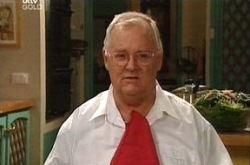 They all catch up, and we get to see that Sky is pretty close to them and that they live the high life, (flying business class, for example), and David throws in a few jibes about the state of Harold's house. Liljana offers to make dinner, and David asks about his car. Stu and Johnathon run into Lou who is on his way to Harold's. Lou isn't impressed to hear the car isn't ready yet, and he wants it done first thing in the morning. Stu tells Johnathon that he has 'pushover' tattooed on his forehead. Johnathon talks more life mechanics mumbo jumbo. 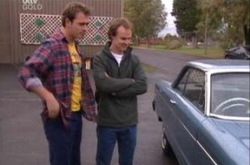 David's a bit worked up about his car, but says he'll pay for the repairs after Harold says he will. Liljana talks about their plans for a big house. 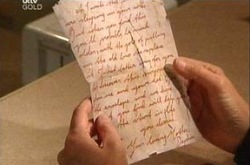 Lou comes over to see everyone, and drops off a present for the Bishop's from Izzy that she left at the door. Sky has drawn a cartoon picture of Harold and Lou with a bubble over their heads that says 'Izzy' in it with love hearts. Her and Serena snigger. Stu tells Johnathon about the time a mate wanted to sue him over a car, but he wouldn't put up with it, "even though he was dealing with grief." Johnathon says that Stu gives people the benefit of the doubt. He serves Stu more life mechanics philosophies, and says that Stu's in control to change his own life. Johnathon asks Stu if he and some mates are coming to one of his seminars. Stu's all for it, as long as there's no chanting involved. Sky tells Serena that Harold owns the Coffee Shop. Serena says that it could have more style, and Sky informs her that the kids around there don't have a lot of that. Serena thinks they will at Eden Hills Girls Grammar, but Sky isn't impressed. They chat about the weirdness between David and Harold. Karl and Susan can smell something like wet dog. They lift up the lino in the kitchen to discover mould... and also an old package addressed to a Jaime Clark. As I write this, Jaime, you are sleeping in your cot. My little bundle of joy. But when you find this, you will probably be much older, with the job of pulling up the old lino to replace it. What better way for you to discover this surprise from me and your dad. Open the envelope and we hope what you find will help give you the start in life you deserve. Your loving mother, Daphine [sic]. 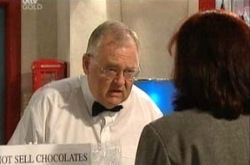 Karl and Susan think to ring Pam and Doug Willis, and also think to ask Harold if he knew them. Susan thinks it's a wonderful thing to do for your child, and wonders where they are now. Harold's house is lively and full of chatter for the first time in ages. Liljana gets Harold to make a toast, but the phone rings before he can. It's Svetlanka, Lil's mum. Everyone goes back to talking, and Harold looks bewildered. Harold's house is chaotic again. The phone rings, David is talking about real estate, Lil makes coffee for Harold when he doesn't drink it in the morning. He tips it out when they're not looking, and escapes to work before Lil can read his coffee grounds. Lou sees Harold. "Good grief, what are you doing here?" "I'm always here!" 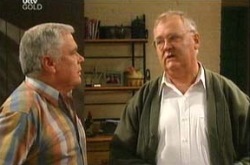 Harold tells Lou he can't cope at home because everyone has taken over. "It's as if I'm not one of them." Lou tells Harold to build a bridge and embrace the time he has with his family now they're here.